Plus, see Hibiki, Yukiho, and Mami compete against Ranko. 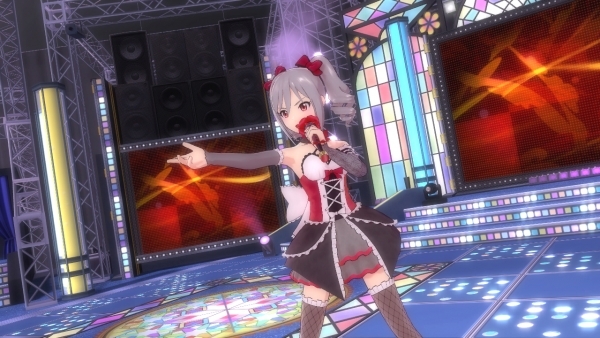 Bandai Namco debuted first footage of Ranko Kanzaki, from The Idolmaster: Cinderella Girls, and Serika Hakozaki, from The Idolmaster: Million Live, in the upcoming The Idolmaster: One For All at Nico Nico Super Conference 3 in Chiba. The pair will be available as downloadable content. A third video shows 765 Productions’ Hibiki, Yukiho, and Mami competing against Ranko in an electrified outdoor idol showdown. Watch the videos below. View some screenshots at the gallery. The game is due out for PlayStation 3 in Japan on May 15.